To comply with the more demanding NOx emission regulations planned for the beginning of 2016, the Austrian sugar company Agrana has to upgrade and replace their combustion systems -3 steam boilers including 4 burners each (50 to 80 to/hr), in their plants at Tulln and Leopoldsdorf. The major stake for Agrana was to comply with the new request of NOx which is < 100 mg/Nm3 and CO < 50 mg/Nm3 @ 3% O2. In April 2013 and January 2014 Fives Pillard Deutschland was awarded a contract to replace the installed equipment with new Pillard LoNOxFlam G2 burners. 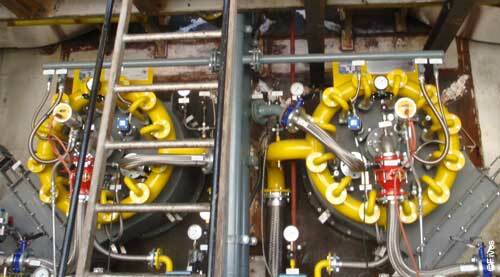 The scope of those turnkey projects consists in the delivery of the new burners incl. accessories, the BMS and the service. The Pillard LoNOxFlam G2 were commissioned at both sites by Fives’ teams within the required time schedule and the target of NOx emission was reached and even overtaken as the NOx emission were between 60 and 80 mg/Nm3 @ 3% O2 for all 3 boilers, while the CO emission were <10 mg/Nm3 @ 3% O2. This new success shows the capacity of Fives to understand the needs of its customers and supply them with ultimate solutions to go beyond their targets.